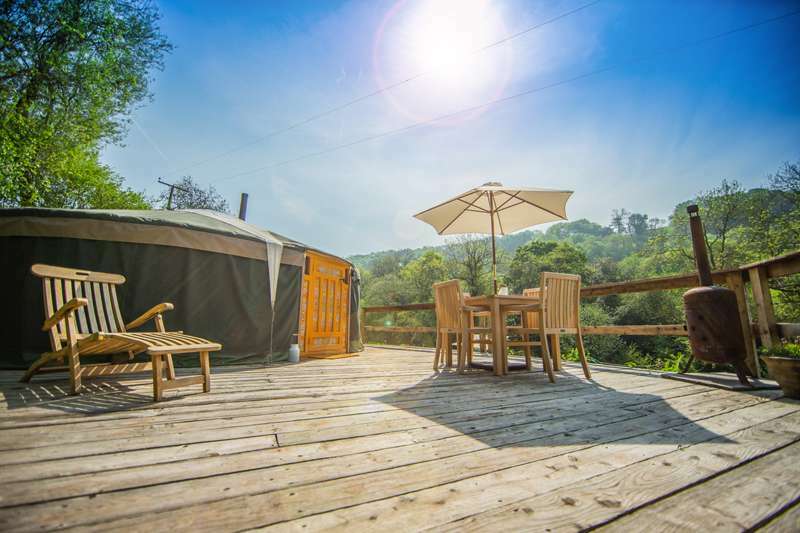 Hidden Valley Yurts – exactly what it says on the tin. Invisible to, and inaccessible from, the outside world, these homely canvas abodes freckle the green face of a picturesque Monmouthshire valley overlooking a gurgling stream and shielded by trees. Secluded on the sprawling Lower Glyn Farm, the five yurts (three for seven people and two for five people) stretch along the top of a beautiful, south-facing meadow alongside the stream. Step through one of the brightly coloured doors of these innovative homes and you’ll find they are light, cosy and warm. Lovingly decked out with beds, chairs, lights, rugs and wall-hangings each yurt is equipped with a wood-burning stove with kindling and wood for fuel. Inside the muffled confines of eight inches of sheep’s wool and felt, the yurts feel intensely private, entreating you to curl up and unwind, having spent the day wandering around the magical woodland, wildflower-peppered meadows and fields belonging to the farm’s 80 acres. Facilities-wise, a large communal kitchen and bathroom area boasts the kind of veranda straight out of Gone With The Wind – it's just the spot for whiling away evenings admiring the sunset or playing a board game. Below the veranda there’s a boules pitch, campfire area, wood-burning pizza oven, safari style dining tent and chicken run where you may collect fresh eggs each day. Within easy reach of Monmouth (Trefynwy), Tintern and other visitable spots along the picturesque River Wye, Hidden Valley is a well-located base for taking in the region's historic and cultural sites. A designated Area of Outstanding Natural Beauty, this corner of Wales has also truly been blessed by Mother Nature – wildlife abounds here. Hidden Valley is home to many species of butterfly, including the uber-rare ‘Dingy Skipper’ (its name doing this little critter’s pretty, patterned wings a disservice) as well as bees, spiders and bats, so be sure to pack your bug boxes and spotters’ guides for a Spring or Summer Watch special. But once ensconced in this beauteous valley, secluded from the outside world, it’s hard to tear yourself away. We came to Hidden Valley feeling stressed and ruffled and left completely the opposite, I was only sad we couldn't stay longer! We were lucky enough to be sharing the site with only two other couples, so it was blissfully quiet for the week we stayed, but I imagine its full of life and noise (in a good way!) when children are there- there is just so much for them to do- streams to paddle in, alpacas to watch, dams to build,places to explore. The kitchen area is wonderfully equipped and has a lovely communal feel to it- I will never forget sitting in the sunshine one afternoon on the swing chair on the veranda eating an ice cream and listening to the birds. There are two bathrooms and toilets, which is useful when its a bit busierand plenty of places to sit and eat, including a huge long communal table under an awning in the glade. The yurts themselves are cosy and beautifully decorated and the one we stayed in (5) had its own balcony and seating area, which was the most gorgeous place to eat breakfast. They even allowed us to have a tesco delivery sent to the site and brought it down to the kitchen for us on the quad before we arrived! The area has loads to see and do and we definitely plan to return. My wife and I, along with our 2 children a 17 year boy and 13 year girl have just returned from the most fabulous, relaxing and unique weekend break we have ever experienced. We didn’t really know what to expect when we left Bristol and being only 30 miles away were surprised to find, hidden in a beautiful valley only accessible by tractor, this tranquil setting. As we arrived both Amanda and Peter (the owners) were there to greet us and take our luggage to our yurt. The attention to detail throughout the camp was fabulous and everything you could possibly need to make your stay stress less was immediately assessable. All the yurts are beautifully decorated, and extremely clean and comfortable. We found the Yurt very spacious and we all had a comfortable bed without anyone having to draw the short straw. There was a wonderful wood burning fire to keep us warm and on the decking outside there was a chimnea and a built in BBQ. The communal Kitchen area was spacious and very well equipped. Peter and Amanda have really made sure that everything you need is there, from communal crockery and sauces right though to a bread maker, 2 ovens( one gas and one electric) a dish washer and even an espresso coffee machine .In the kitchen each Yurt has its own designated fridge and cupboard space. The large communal eating area around the kitchen allows you to spend time enjoying your food at a leisurely and unrushed pace. The showers/bath and loos were spotless and the solar heated water (backed up by an immersion heater) were hot and plentiful. The whole area was clean and well maintained .Again if you had forgotten any basics, on hand were some communal toiletries you could use. The stream is a constant source of enjoyment for the younger children and there is plenty of room for children to run around without imposing on other families’ peace and quiet. We went canoeing at Symonds Yat which is only a half an hour journey by car, and there are plenty more things to do within a half an hour drive. In the communal area there is a whole book of ideas on what to do and where to go. We did wonder whether our kids because of their ages would find it too quiet, in fact they enjoyed it immensely and it gave us all some quality family time. For a relaxed break and an easy going atmosphere the Hidden Valley is an absolute must and we would like to pass on our thanks and congratulations to both Peter and Amanda. We’ve just had a wonderful weekend at Hidden Valley Yurts. 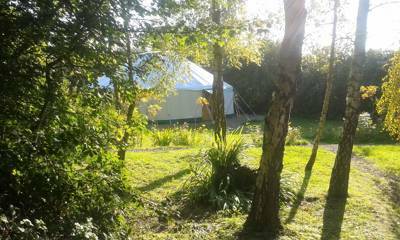 2 adults and 2 boys ages 2 and 4 stayed in a yurt that sleeps 7 and we has oodles of space you could easily fit another 3 people in comfortably. The yurt was lovely and cosy when the evenings were a bit chilly (helped a little by the lovely wood burning stove)and lovely and cool when it was nice and sunny outside. The location and facilities were marvellous. The field where the yurts are located is a great size plenty of space for our boys to explore and have fun in, and the stream that borders the field is perfect for paddling in wellies or crocs and building dams. The kitchen and bathroom facilities were excellent. The kitchens were extremely well equiped, a bread maker and dishwasher on a campsite....you can’t ask for more than that and the loos and bathrooms were cleaned everyday. We made full use of all that Hidden Valley Yurts had to offer including the wood fired pizza oven and the complimentary art materials. This was my very first adult camping experience as I’m very much an urbanite (more than 5 minutes from a starbucks and I get cold sweats), but I’m a convert to the great outdoors. I can’t recommend this site highly enough and we’ll definitely be back for more soon. Yurts, eco friendly camping – yes. Caravans, dogs – no. Whole-site bookings for friends and families are welcome. They're pretty flexible and always happy to discuss accommodating groups. 5 yurts: 3 x 7 person and 2 x 5 person. There’s a large kitchen and communal bathroom ‘block’ on wooden decking, with picnic tables and hammock, overlooking the valley. The kitchen has all you need and the bathroom has 2 showers and 2 loos. All water comes from a local spring and is flushed away onto a reed bed. There’s another kitchen area and two rustic compost loos not far off and a small kitchen between the first 2 yurts. The main kitchen has a breadmaker and built-in BBQ. Head for Monmouth, a pretty little town with nice shops and a couple of decent pubs. It’s easy to while away a few hours here. Tintern is also fairly near, with its majestic abbey ruins made famous by Turner’s watercolour painting and Wordsworth’s poem. Just a mile away (though it’s uphill all the way) a really warm welcome awaits you from John and Joy at The Carpenter’s Arms in Llanishen. But you’re spoiled for choice in this area, with gastro pubs the Raglan Arms (01291 690800) in Llandenny, AA Pub of the Year 2012 The Inn at Penallt (01600 772765) near Monmouth, The Hardwick (01873 854220) in Abergavenny and two with Michelin stars, The Walnut Tree (01873 852797) in Abergavenny and The Crown at Whitebrook (01600 860254). Andy and Jackie at The Inn at Penallt (01600 772765) promise you a warm wlecome, sophisticated dining and unparalleled garden views. Try the Butty Bach ale – Welsh for 'Little Mate'! Easter until the end of September. Off-peak accommodation from £240 for a 3 or 4 night stay. Late deals are offered on Facebook and Twitter. From junction 24 off the M4 take the A449 for 71/2 miles, then take the A472 towards Usk and turn right immediately (this is pretty tricky) onto the B235 signed ‘Chepstow’. After a mile you’ll reach a fork at Gwernsey, bear left towards Llansoy. Carry on until you reach a crossroads, go straight over (signed ‘Monmouth’) then after 3/4 mile turn right towards Llangovan on a single-track road. After 2 miles (feels a lot longer) the road turns left. Shortly after this there’s a sharp bend to the right, where a track to the left goes off to Lower Glyn Farm – this is your stop, so head down there. The car park is located just above the farmhouse. When you’ve parked check in at the farmhouse and you and your stuff will be transported in a rugged-terrain buggy to the yurts.